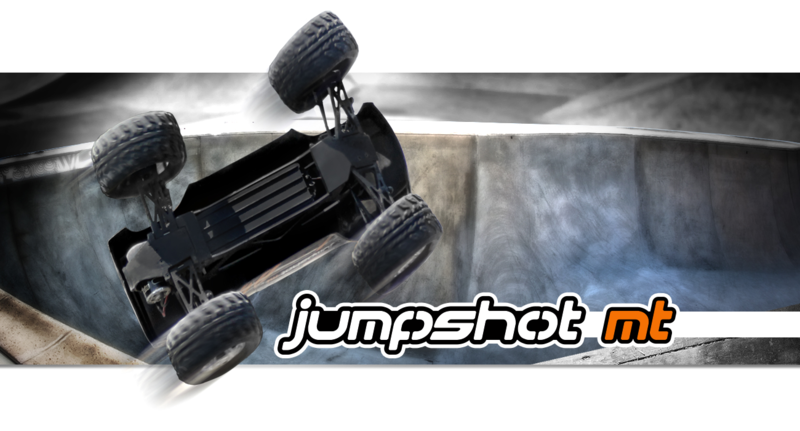 The Jumpshot MT is super-easy to drive and get familiar with - all you have to do is plug in the included battery and switch on the radio and car. It's that easy! To drive the truck, simply pick up the controller with your left hand, put your left index finger into the trigger area, and then put your right hand on the steering wheel - it's as natural as driving a real car! Turn the wheel to go left and right, and gently pull on the trigger with your left index finger to go forwards. To stop the Jumpshot MT, gently push away from you with your left index finger - hold it there to go into reverse. It takes seconds to get used to this easy operation, and in no time at all you'll be ripping off jaw-dropping, big-air jumps and stunts! 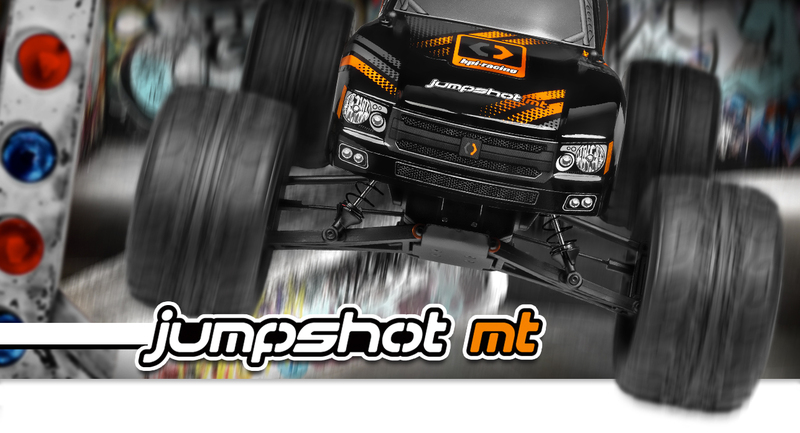 The Jumpshot MT drives and performs fantastic right out of the box, however if you want to, it's easy and quick to adjust plenty of settings, exactly like a real monster truck! 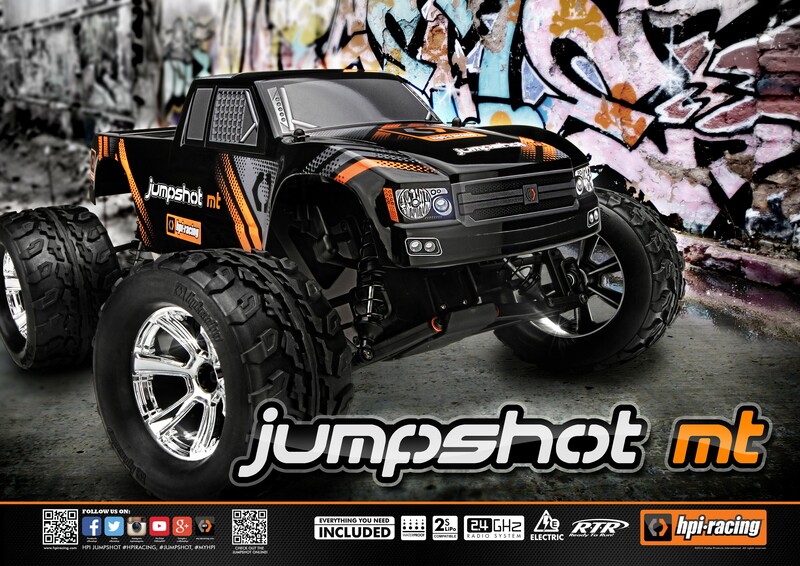 Ride height, shock angle and more merely a turn away with your fingers or a wrench if you want to dive under the hood - HPI make it easy to be your own monster truck mechanic AND driver! 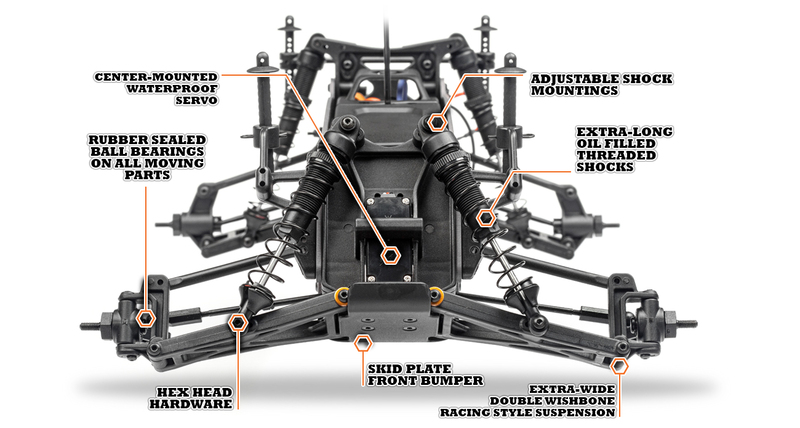 More complex adjustments such as camber settings can be done with option parts you can get from your RC hobby shop. Huge all-terrain tires are one of the things that makes real monster trucks stand head and shoulders above everything else around them, and the Jumpshot MT does not disappoint! 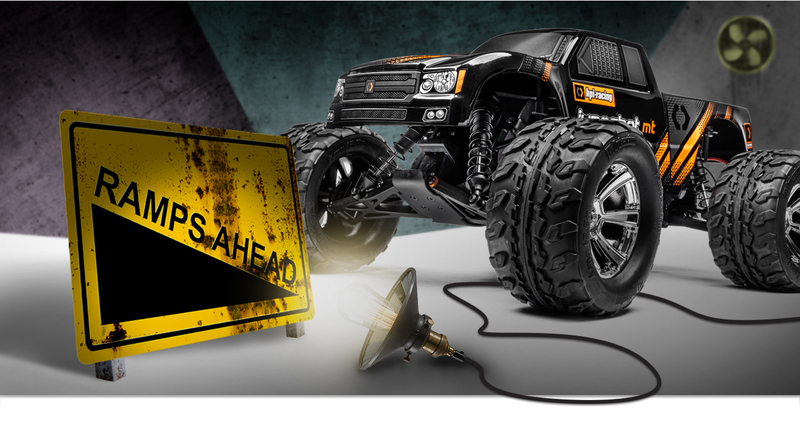 Tackle terrain anywhere with tall, real rubber tires with huge lugs that can handle dirt, grass and loads more! You can also hit the wet stuff, too: the extra-wide tires let you roll over mud, snow as well as over jumps and any obstacles that may get in your way! The tires are wrapped around extra-cool looking chrome wheels that look great whether the Jumpshot MT is sitting on your shelf or kick up mud and rocks as it's flying across a stream. The Jumpshot MT is built just like the legendary and award-winning Savage, with a TVP (Twin Vertical Plate) lightweight aluminum chassis that runs from the front to the rear. 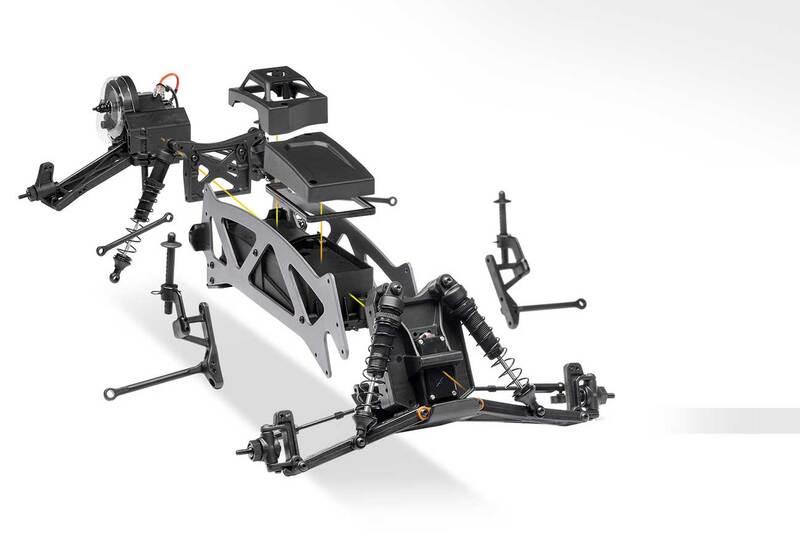 Sandwiched between the chassis plates are the battery and electronics boxes, plus the steering module and transmission with the suspension mounts. This makes the Jumpshot MT extra-strong and super durable so you can have fun for hours and hours! With durable skid plates front and rear, ribbed battery box door and Savage-style TVP (Twin Vertical Plate) lightweight aluminum chassis, the Jumpshot MT is made to take anything you can throw at it! 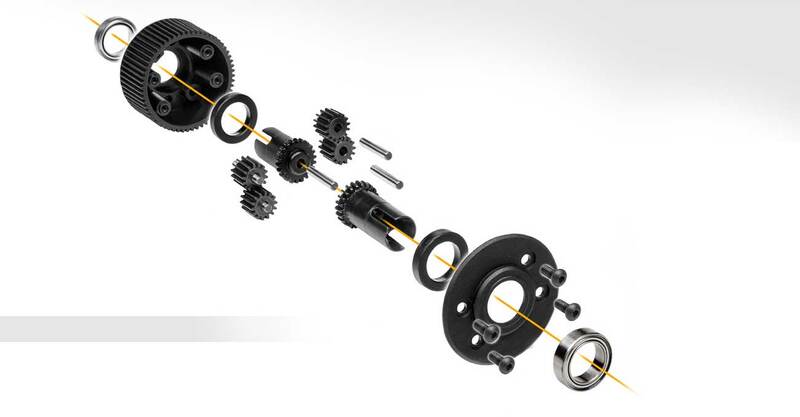 Tough yet flexible suspension parts flex when the truck hits something hard, and the wheels are made from impact-resistant nylon plastic material so they won't split or crack under pressure. The Jumpshot MT is made to take a beating! 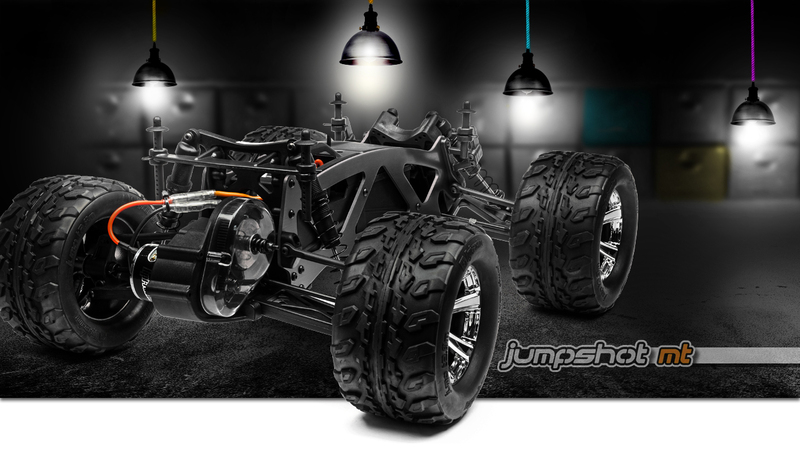 The Jumpshot MT is equipped with long-stroke, oil-filled shocks just like you see on real monster trucks! 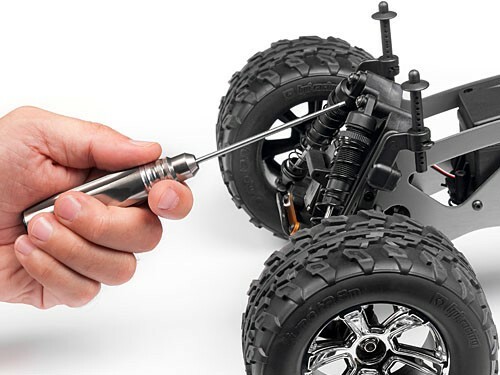 The outside of each shock absorber is threaded so you can quickly adjust the ride height: lower the truck for on-road action, and raise it for big-air stunts! The Jumpshot MT lets you run in wet conditions because the electronic speed controller and steering servo are fully waterproof, plus the receiver and battery are protected within their special compartments to keep the worst bits of mud and big splashes of water away from them. 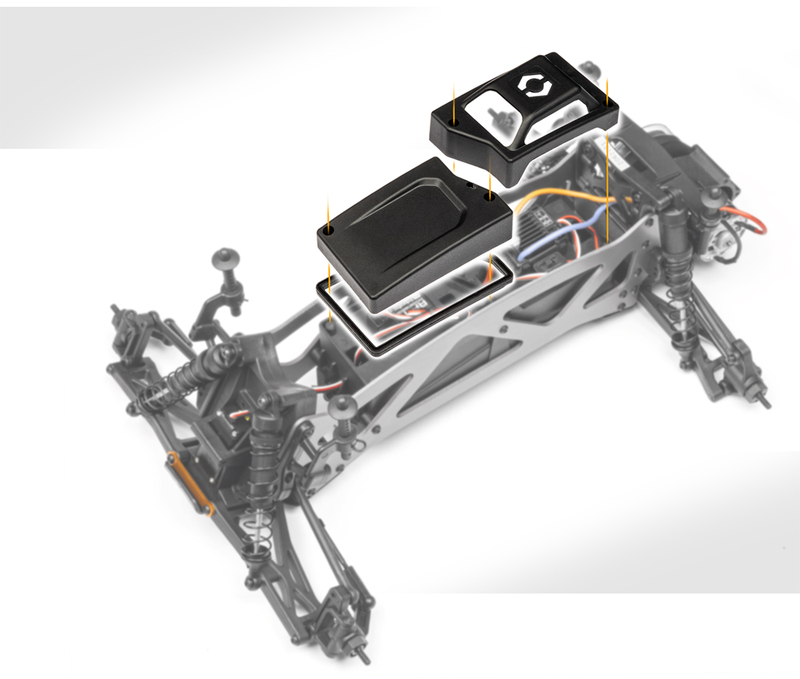 The Jumpshot MT features a hinged battery door underneath the chassis so you don't need to take the body off to change battery packs. Driving with your friends has never been so easy! 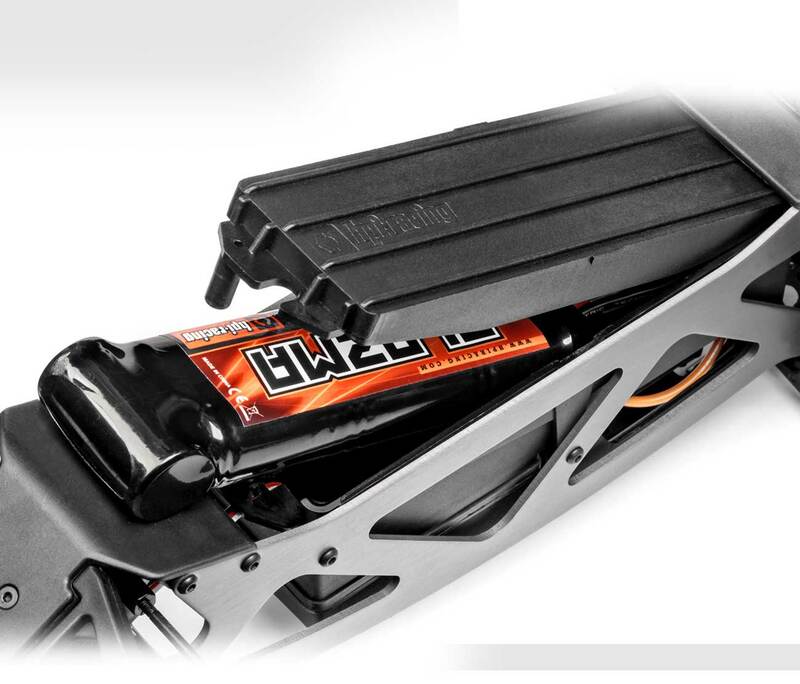 The battery door is secured with a metal clip and the full-length ribbing allows it to function as a chassis skidplate.